ESA’s Venus Express has made unique observations of Venus during a period of reduced solar wind pressure, discovering that the planet’s ionosphere balloons out like a comet’s tail on its nightside. The ionosphere is a region of weakly electrically charged gas high above the main body of a planet’s atmosphere. Its shape and density are partly controlled by the internal magnetic field of the planet. For Earth, which has a strong magnetic field, the ionosphere is relatively stable under a range of solar wind conditions. By comparison, Venus does not have its own internal magnetic field and relies instead on interactions with the solar wind to shape its ionosphere. The extent to which this shaping depends on the strength of the solar wind has been controversial, but new results from Venus Express reveal for the first time the effect of a very low solar wind pressure on the ionosphere of an unmagnetised planet. As this significantly reduced solar wind hit Venus, Venus Express saw the planet’s ionosphere balloon outwards on the planet’s ‘downwind’ nightside, much like the shape of the ion tail seen streaming from a comet under similar conditions. 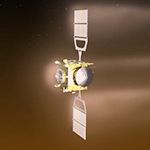 Six years of observations by ESA’s Venus Express have shown large changes in the sulphur dioxide content of the planet’s atmosphere, and one intriguing possible explanation is volcanic eruptions. The thick atmosphere of Venus contains over a million times as much sulphur dioxide as Earth’s, where almost all of the pungent, toxic gas is generated by volcanic activity. Most of the sulphur dioxide on Venus is hidden below the planet’s dense upper cloud deck, because the gas is readily destroyed by sunlight. 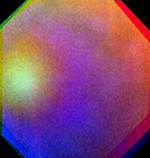 That means any sulphur dioxide detected in Venus’ upper atmosphere above the cloud deck must have been recently supplied from below. A previous analysis of infrared radiation from the surface pointed to lava flows atop a volcano with a composition distinct from those of their surroundings, suggesting that the volcano had erupted in the planet’s recent past. Now, an analysis of sulphur dioxide concentration in the upper atmosphere over six years provides another clue. Scientists and amateur astronomers around the world are preparing to observe the rare occurrence of Venus crossing the face of the Sun on 5-6 June, an event that will not be seen again for over a hundred years. The occasion also celebrates the first transit while there is a spacecraft orbiting the planet – ESA’s Venus Express. ESA will be reporting live from the Arctic island of Spitsbergen, where the Venus Express science team will be discussing the latest scientific results from the mission while enjoying a unique view of the 2012 transit under the ’midnight Sun’. A transit of Venus occurs only when Venus passes directly between the Sun and Earth. Since the orbital plane of Venus is not exactly aligned with that of Earth, transits occur very rarely, in pairs eight years apart but separated by more than a century. The last transit was enjoyed in June 2004 but the next will not be seen until 2117. Venus transits are of great historical significance because they gave astronomers a way to measure the size of the Solar System.